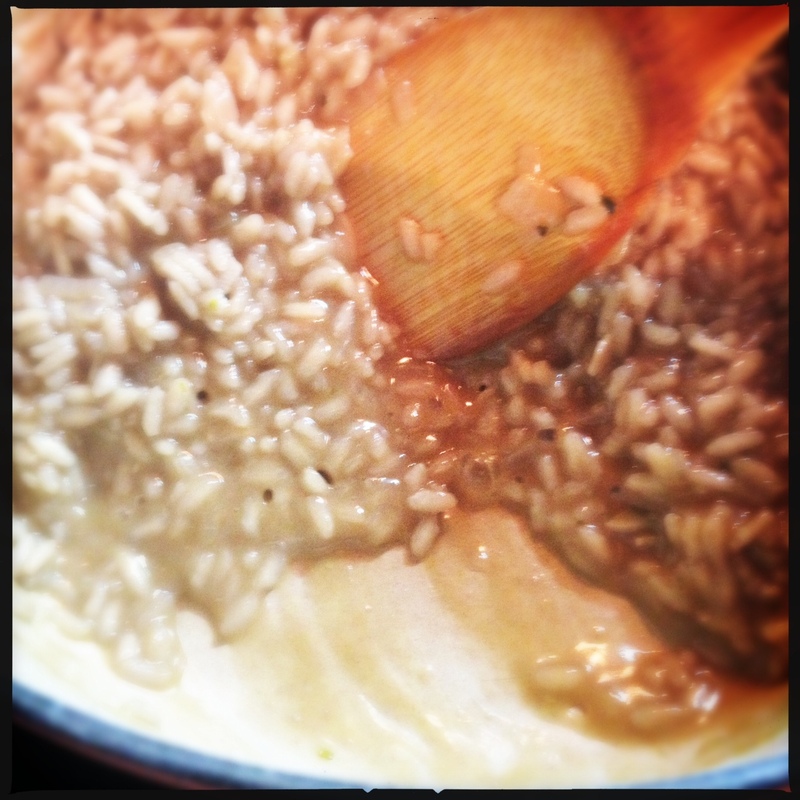 i’ve only made risotto once before, but i have been reminded many times by tom colicchio in a few top chef episodes that it can be quite tricky. in fact, once again a chef was just recently eliminated by making one not to the judges liking. 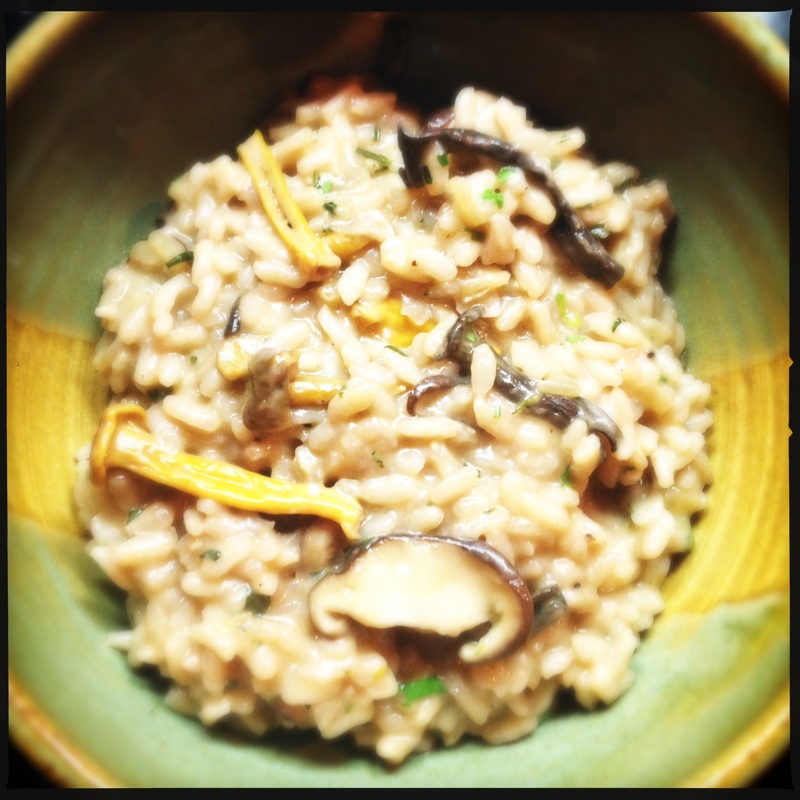 i’ve had a wild mushroom risotto at past top chef winner ilan hall’s restaurant the gorbals, and mr. colicchio’s vegetable risotto at craftsteak in las vegas, so i have an idea of what the consistency and taste should be. what is so damn difficult? 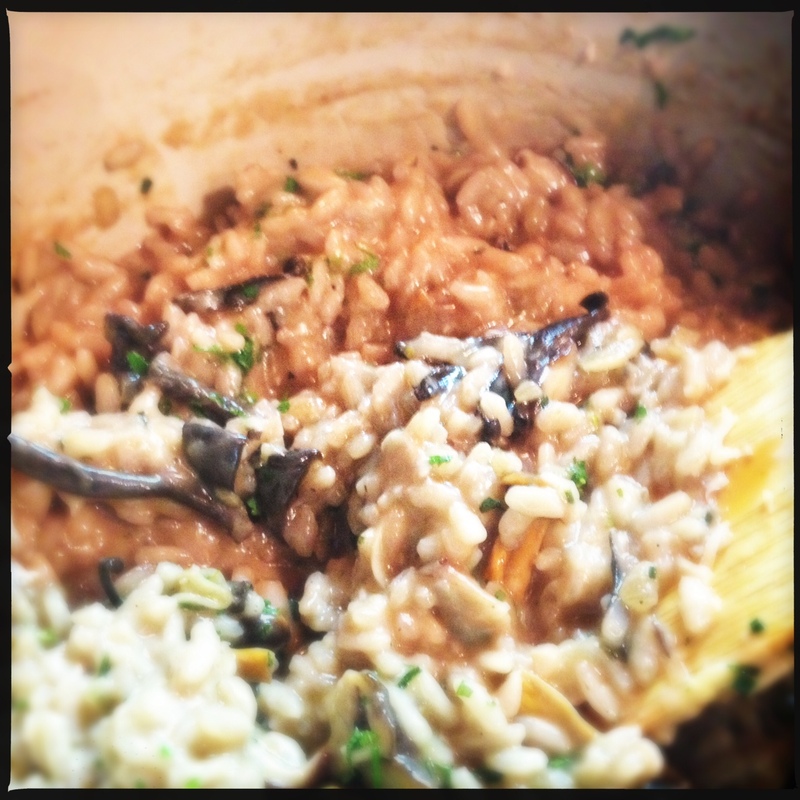 karl, my mushroom guy, at the hollywood farmers market had a wide array of mushrooms sunday, so i thought i’d try my hand at a wild mushroom risotto. i chose black trumpets, chanterelles, and shiitakes. i compiled the list of ingredients and amounts after the fact, so some are approximations, and others are optional or interchangeable. for instance, i grabbed what i thought was frozen vegetable stock from my freezer and as it melted i realized i had in fact taken out a container of lobster stock. i happened to have tarragon and savory on hand, but sage and thyme could also work, and white wine can be used instead of red. heat the stock so it is warmish-hot. sauté about 1/3 of the garlic and onion in some olive oil for about 3-5 minutes or until translucent. add the mushrooms, butter, tarragon and savory and continue cooking for a few minutes until the mushrooms have just browned. add some s+p to taste. set aside and keep warm. coat the bottom of and heavy bottom pan, such as a dutch oven, with olive oil and sauté the remaining onion and garlic until translucent as well. 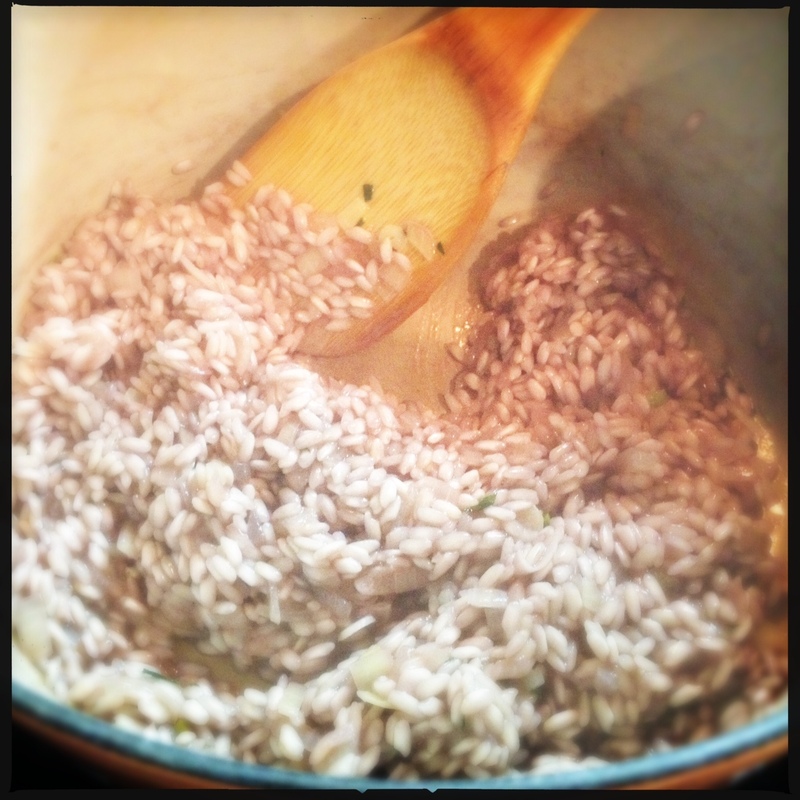 add the rice and stir quickly allowing the rice to be coated with the oil and opaque, about a minute. apparently this cooks the starchy coating and keeps the rice from sticking. add the wine and stir until it is almost evaporated. add the stock, a ladle at a time, and stir until just absorbed. 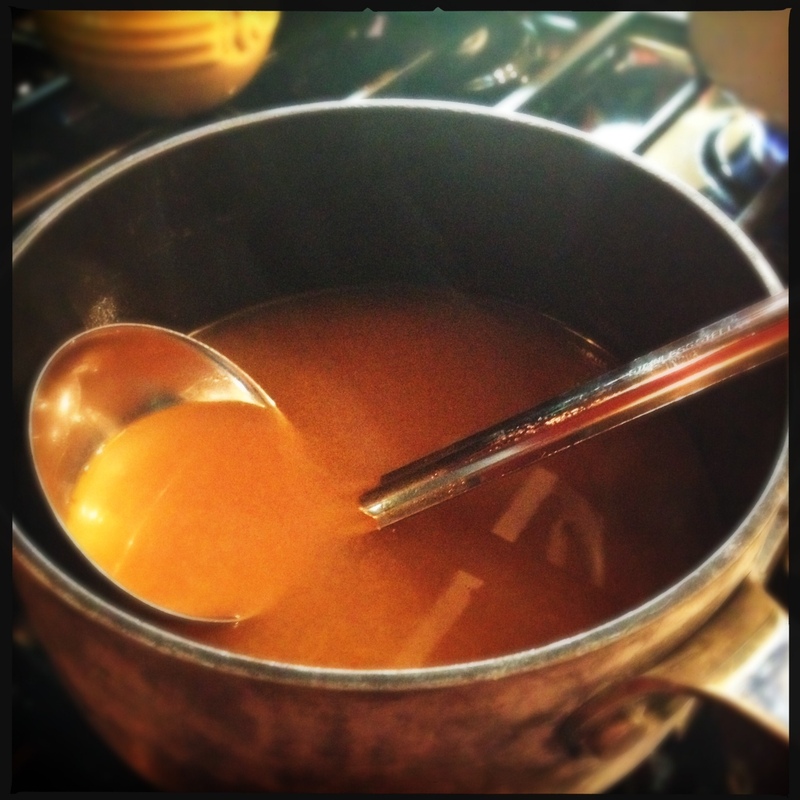 then add the next ladle of stock and repeat each time allowing the stock to be incorporated until your stock is gone. stirring continuously should help cook the rice evenly and not stick to the bottom of the pan. i noticed a couple ladles near the end of adding the stock the rice still seemed to be a bit al dente, and also the rice and stock seemed to be making a creamy saucy consistency. by the time the final ladle had been incorporated the rice was perfectly cooked and not mushy. 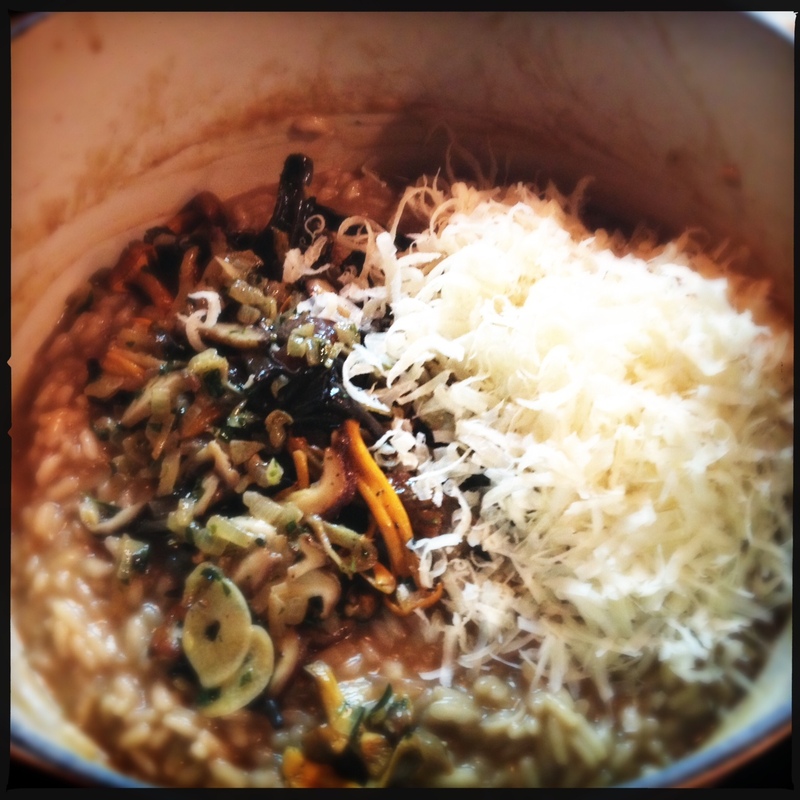 the risotto shouldn’t be too thick, but also not runny. it should almost ooze. 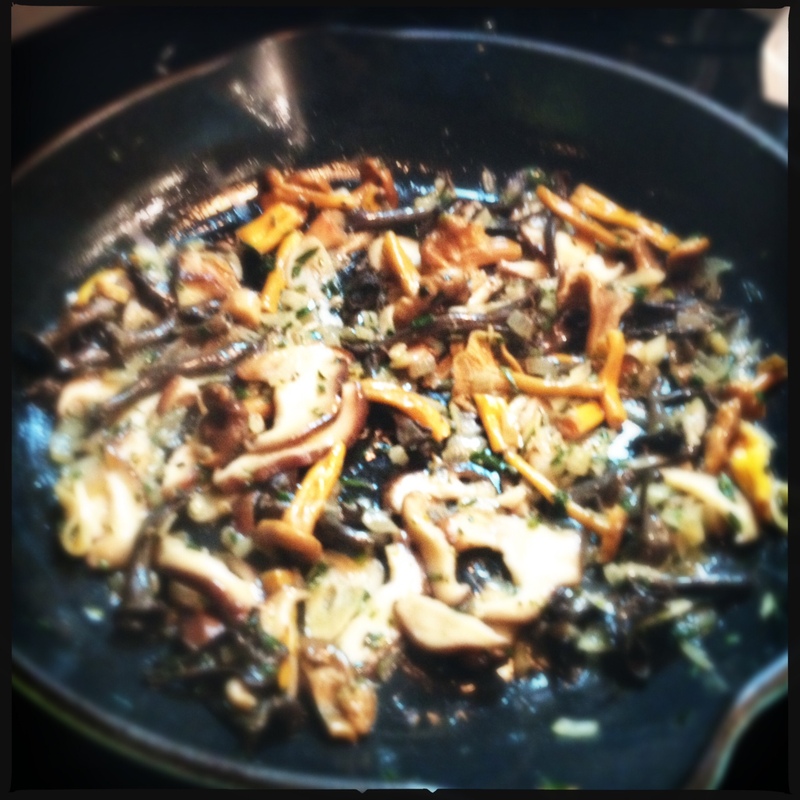 stir in the mushrooms, parmesan and parsley. add s+p to taste. i must say even though i was a bit skeptical the lobster stock might not be the right choice when i was defrosting it, it turned out to be a really nice compliment to the earthy mushrooms. granted i know i only made a small batch, i’m not working in the confines of a kitchen foreign to me, and i was able to use my own equipment and tools, but this just wasn’t that hard, and it turned out really tasty. i certainly doubt i would get eliminated on an episode of top chef for this dish, and who knows perhaps i would win?